As everyone knows after the K-T extinction, mammals rose to become the dominant species on Earth. Not quite, for on the island continent of what is now South America, the top predators where avians, Phorusrhacids more commonly known as Terrorbirds. These large ground dwelling birds established themselves in South America and remained unchallenged for 60 million years, until the formation of the land bridge between North and South America. Remains of terrorbirds have been found in Florida and Texas, however their attempted colonisation of the North failed, and they were no match for the canine, feline and ursine predators they encountered. About 1.8 million years ago they became extinct. elsewhere, I was reading that Dr Roberts is concerned about the ethics of de-extinction, it seems science has now reached a stage that the genome for the wooly mammoth is complete, and bringing the mammoth back is now a real possibility. Pliocene Park, if not Jurassic Park. What's really exciting about this particular discovery is not the fact that it's apparently the biggest but that there have been such a variety of skeletal remains (from more than one individual animal) so far recovered. Up to now overall size has been little better than a "guesstimate" when it came to these giants due to the minimal skeletal clues from which to judge and there has been more than a hint of one-upmanship with regard to successive claims to have found "the biggest". With this find the more complete skeletons will hopefully not only better ascertain actual size for this species but also vastly increase our knowledge of how they were articulated, how their body mass and muscle were distributed, how they moved, and ultimately how they really fitted in to their environment and for how long they lasted. Here is one prehistoric animal thought to be well and truely extinct, but turns out that it isn't. There's something fishy - pardon the pun - about that living fossil shark story. The report says it's the biggest shark ever discovered and implies it is related to the extinct giant shark Megalodon. Megalodon is well known from fossils and its possible living presence in the deep oceans has been the subject of several pulp-fiction thrillers. If a living relative of the extinct shark was really found it would be a sensational discovery right up their with the real finding of living Coelocanths, or the more elusive finding of a Yeti. But strangely no other news outlet seems to be reporting it, not even the Daily Mail or the Star and I'd have thought it was right up their street. And the renowned experts from the Smithsonian and Sydney University do not seem to exist outside of that story. I think it's a hoax. An American Israeli Jewish Zionist publication (their own description) such as "World News Daily" couldn't be telling porkies, could it? I suspect you may be right, MM. Trike, you may find this Guardian article interesting. Hot on the heels of the news that the Brontosaurus possibly does indeed deserve its own genus Dr David Hone uses forensic examination of a Daspletosaurus's skull to construct a hypothesis concerning a certain Tyrannosurian's behaviour and the ecosystem of which it was a part. Bronto looks none the worse for his enforced 100 year exile from the official ranks, but my how T Rex has spruced up in recent years! 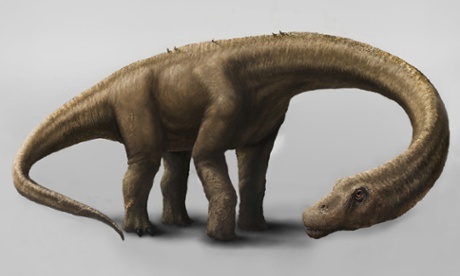 That picture is, I think, of a classic long-tailed diplodocus-type sauropod, Nordmann, not a brontosaur/apatasaur (a shorter-tailed diplodocid sauropod) ... the head/face/jaws would be more blunt/rounded, and the tail would be much shorter in a brontosaur .... (although I fully accept that I might be speaking complete rubbish since the major problem with the type Brontosaurus skeleton is that it was missing it's head, and so for the past century it's been subject to much conjecture and repeated reclassification). 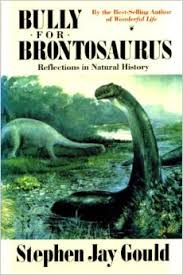 Also note that the genus Brontosaurus died out about 70 million years before Daspletosaurus (or indeed any other Tyrannosaurs) appeared on the scene ... although I accept you never claimed anything like that at all. But it is still perhaps worth repeating, just for interest if nothing else, that the distance in time between Brontosaurus and Tyrannosaurus, 70 million years or so, is about the same as separates Tyrannosaurus from ourselves, the genus Homo. Still, it's nice to see that people are finally starting to accept the idea of feathered tyrannosaurs ... 'the twenty ton chickens from hell' ! The Jurassic Park franchise should take note as there's loads more evidence for fluffy, feathered Velociraptors! And bid his neighbors 'bye. The happenings of the day. His teeth were made to gnash. Thanks Viz, I was going to google that later but you've saved me the bother. I have no idea where that bubbled up from, some where in the muds of time. That picture is, I think, of a classic long-tailed diplodocus-type sauropod, Nordmann, not a brontosaur/apatasaur (a shorter-tailed diplodocid sauropod) ... the head/face/jaws would be more blunt/rounded, and the tail would be much shorter in a brontosaur .... (although I fully accept that I might be speaking complete rubbish since the major problem with the type Brontosaurus skeleton is that it was missing it's head, and so for the past century it's been subject to much conjecture and repeated reclassification). The picture is of Apatosaurus Excelsus, which now is being generally regarded as worthy of being awarded its own genus. Apatosaurus Excelsus was the species originally identified as Brontosaurus Excelsus and which had been re-classified in 1903. The suggestion is simply to revert to that classification and reserve sub-classification until further research establishes any relatives. Here is a link to Schlopp's original paper. The main problem with Brontosaurus depictions in the past was that the animal didn't officially exist scientifically, even though its name "Thunder Lizard" continued to enjoy popular interest - so much interest that it was one of the few dinosaur names that almost anyone could recount. Its continuation in popular literature invited pictorial representation, though not necessarily based on interpretation of scientific data which would, of course, simply instruct the artist to depict an Apatosaurus. If one looks at its popular depiction throughout its century of exile you can see quite a few proportional variations along the way. The picture above actually reverts Excelsus back to its more exact anatomical interpretation though of course further research will undoubtedly bring alterations. Thanks for the link to Schlopp's paper. Yes, I was indeed completely wrong ... seems that I've been the, behind-the-times, out-of-date dinosaur there! Hey ho. But still, bully for Brontosaurus! I was disappointed when Brontosaurus was said not to be a separate genus. I suppose the recent news about the young lad who discovered the dinosaur remains under the supermarket in Texas (or should I more correctly say site of a new supermarket?) makes a difference from a King (or nun depending on your preference and opinion) under a car park. I'll see it when it appears on youtube. It appears they've found another of your cousins Trike. 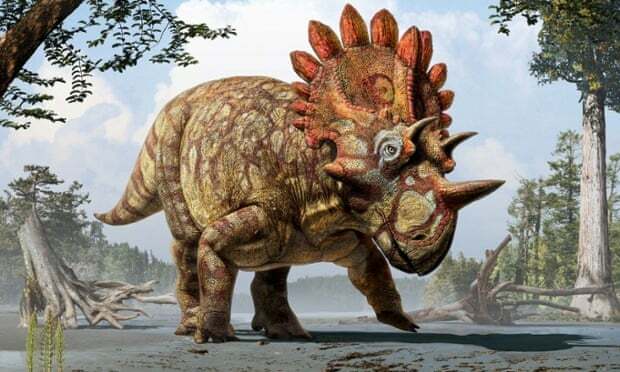 The Regaliceratops is being nicknamed the Dinosaur Hellboy due to his cute little horns over his eyes. So I see, Nords. Absolutely brilliant. Wonder how many other species are still to be discovered. I was watching (rather vaguely) David Attenborough last night (and who knows how out-of-date programmes from Britain put on here might be), where he got excited about one of the dinosaurs. They had found some furry bits on an early vertebrate which originally they assumed to be for warmth. But further investigation (and assumptions?) have made the scientists wonder if it is, instead and quite differently, the residue of feathers and therefore this was the beginnings of flight. I presume this was before the time of the Apteryx. I find the ideas of evolution difficult. What then made this vertebrate suddenly decide these odd feathery things that had appeared should mean they launch themselves off cliffs and find their bodies fit for flying? Or did it come into their not very big heads that flight would be useful and they should convert parts of their bodies to this purpose? Those "furry bits" might well have evolved primarily as heat insulation before evolving further into feathers which enabled flight. They might have evolved as both at the same time, or as colourful display features, or even as something else entirely. And there I nearly wrote, "evolved primarily for insulation", which would have been a bit silly ... no organism "decides" it would be a good idea to evolve a handy new appendige. (The idea that say, giraffes' necks, get longer through the generations as they stretch for the highest leaves follows the ideas of Jean-Baptiste Lamark, which was postulated before Darwin but has long been abandoned as there is no biological mechanism by which this can possibly occur). The lines of evolution can be seen in hindsight but the creatures at the time are just trying to survive to pass on their genes. A primative lobe-fin fish might possibly wish there was an easier way to get from its rapidly drying pool to a bigger one but it cannot decide to evolve its fins into legs. But in a population of fish in which there will inevitably be some genetic variation between individuals, those that carry in their DNA code genes for very, very, very slightly more robust fins might just be the ones to make it out when the pond finally dries up ... to go on to breed and perpetuate that trait thereby aiding the survival of generations to come. Those fish not so genetically advantaged tend to die off, and their genes with them. Or with antibiotic-resistant bacteria ... they don't decide to evolve their resistance, it's just the ones that do already have some resistance don't get killed off, and and so the population as a whole gradually becomes made up only of those with resistance, and with each successive generation, even better resistance. Regarding Apteryx (the kiwi) I think it's been shown by DNA studies that they actually evolved from previously flying birds ... and so like their relations the emus and cassowaries, their ancestors just lost the ability to fly. Flying is an energetically expensive pursuit requiring lots of food. On islands like New Zealand with no terrestrial mammals its not uncommon for some birds (over many generations of course) to lose the ability to fly. Again they don't decide, "nah, can't be bothered with that", but rather the trait dies out since it has become an expensive liability and those having it are more prone to die or be killed before breeding and passing it on to their offspring. Kiwis' feathers, which as you say are quite fur-like, still serve very well as thermal insulation though. Not surprising then that they only ever lay one at a time! Thanks for that, MM. But you know, I didn't mean Apteryx at all - I meant to talk about the pteradactyl! Should check things. NZ has quite a lot of flightless birds or birds with limited flight because of the lack of mammalian predators - as well as kiwi there are takahe, weka, pukeko, penguins, and some extinct ones like the moa and some species of wrens. There is apparently disagreement about whether kiwi lost the ability to fly and their wings, or were descended from a wingless ancestor though they do have some sort of vestigial wing apparently. I think all the others do have wings - they just don't use them much or not at all. Pukeko can fly a little, enough probably to escape from a dog. Ah yes pterosaus, or at least some of them, have been shown to have had "hair-like" fibres (called pycnofibres) covering their bodies. 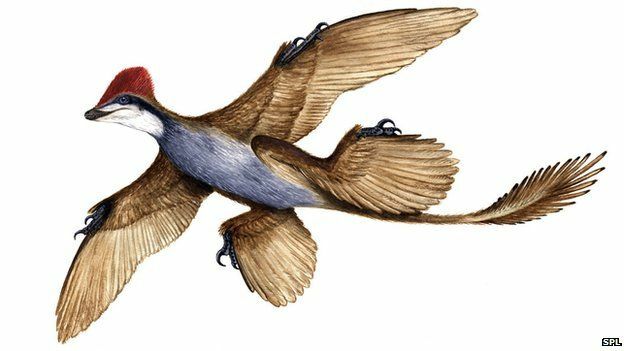 This wasn't of course true mammalian hair nor was it proto-bird feathers, since pterosaurs did not evolve from either early mammals nor from early birds. I think there's a still a lot of debate exactly which group of early archosaur reptles pterosaurs did evolve from, but it is almost certainly not synapsid reptiles (ancestors of hairy mammals) nor saurischian dinosaurs (ancestors of feathered birds). So pycnofibres were unique to pterosaurs, though presumably originally evolved from reptilian scales (as also independently, did hair and feathers). Sordes - a "hairy" pterosaur. But since a pterosaur's wing is made of a skin membrane stretched between the bones of the arm and elongated 4th finger, such pycnofibres played no role in actual flight (other than possibly as a minor stream-lining/anti-drag effect), but rather almost certainly provided thermal insulation for the pterosaurs' skinny/light-weight bodies. Or were you thinking of Archaeopteryx (the genus of bird-like dinosaurs that is transitional between between non-avian feathered dinosaurs and modern birds) ... and all its relations and immediate ancestors? There's still a lot of discussion about how and when feathers evolved, but aided immensely by loads of new fossil finds over the past 10-20 years in China, it's becoming clearer - and quite complex. But it does make a lot of sense to me that proto-feathers first evolved primarily as insulation (or maybe also for display) and only later became further evolved in birds as suitable for gliding and then later for active flight ... while at the same time remaining as insulating or colourful fluff and crests in non-avian dinosaurs (like Tyrannosaus and Velociraptors) which were around long after flying feathered birds had appeared but were themselves (T-rex and raptors) still, at least partially feathered). 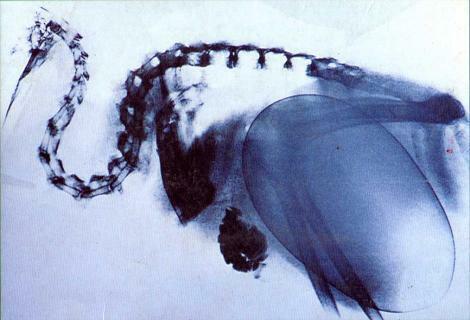 Archaeopteryx - "... it's the early bird that catches the baby Compsognathus"
I'd forgotten that as well as losing flight-feathers, kiwis have also lost nearly all their actual wing bones too (obviously so when I look at the above X-ray). Moas also had only a few tiny vestigial remains of their arms/wings .... in contrast to ostriches and emus that, while incapable of flight, do still have small boney wings hidden under all those shaggy, fluffy feathers. Sorry to witter on but I find palaeontology and evolutionary biology absolutely fascinating. And it was always a good discussion point on the old BBC science message board .... especially for baiting the evangelising Young Earth Creationists! Ah yes, archaeopteryx, of course. The David Attenborough programme did mention colour with the fur/feathers, but he definitely seemed to see a dichotomy between them, not that it could be both/and, which you are suggesting is quite feasible. My first thought about the kiwi's residual wings was that it would mean that they had descended from a flighted bird, but had lost that ability with a lack of use; however it could also be, couldn't it, that they began to develop wings, then the need disappeared and the wings never evolved more? Integumental evolution has, in recent years, become a fascinating study in its own right. Interestingly, one of my first introductions to the subject (as with nearly every other scientific subject too) was the How And Why Wonder Book treatment of the theme. Its front cover illustration played safe when guessing Diplodocus's colour scheme (by the then current standards in such guesses) but rather interestingly predicted much more modern trends regarding the carnivore on the riverbank. This corresponds to its internal illustration of an Allosaurus, if I recall, who also rather polychromatically defied the then prevailing assumptions that dinosaurs went in for dark grey or jungle camouflage. It seems to me that the endless variation in nature, and the obvious inter-relatedness of all species, is one very big argument for NO God, and especially not an 'intelligent designer' of a God. Re kiwis - they must have descended from a flying or at least gliding bird which had fully developed wings. All birds - and kiwis are certainly birds - are descended from a common ancester (or strictly an ancestral breeding population) which was most likely an Archaeopteryx, or least a very close cousin species, way back in the Jurassic. Archaeopteryx had true flight feathers, a wishbone, and could certainly glide, if not fly short distances. After this common ancestor, birds seem to have rapidly diversified into many diverse forms many of which became extinct leaving no representatives today. The line that lead to the kiwis and other ratites (ostriches, rheas, cassowaries, moas, elephant birds, and all their ancestors) seems to have branched away from the line that gave rise to all other modern birds quite early on in about the early Cretaceous, but as a group the ratites only really "took off", as it were, after the Cretaceous extinction when some of them, becoming very large, filled the ecologic niche left by the extinction of predatory non-avian dinosars. What distiguishes the modern ratites as a group is the lack of a developed keel on the sternum rather than loss of the wings. A kiwi or emu, even if it had well developed wings would still be unable to fly without strong pectoral flight muscles anchored to a deep projecting breastbone. (Conversely chickens while having fairly poorly developed wings, do still have a well developed breast bone and mass of muscle, the breast meat, and can still make a good attempt at flying a short distance if they have to). 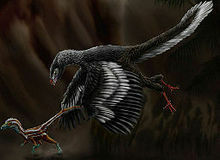 However it seems that the reduction of the sternum and hence flightlessness evolved independently several times since the Tinamous (which have a keeled sternum and can fly) have, by DNA studies, been shown to be very close cousins of other living ratites, which strongly suggests that ancestral ratites, way back in the Cretaceous, could indeed fly and indeed that some were still capable of flight well into the Tertiary. 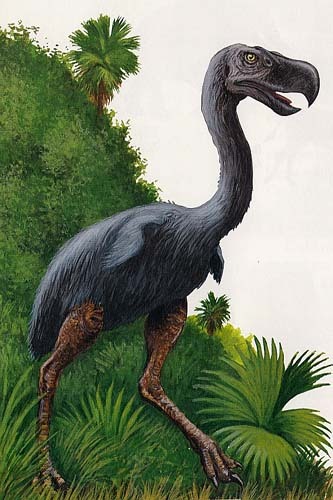 "Although it was long presumed that the kiwi was closely related to the other New Zealand ratites, like the moa, recent DNA studies have identified its closest relative as the extinct elephant bird of Madagascar, and among extant ratites, the kiwi is more closely related to the emu and cassowaries than to the moa. Research published in 2013 on an extinct genus, Proapteryx, known from the Miocene deposits of the Saint Bathans Fauna [South Island NZ] found that it was smaller and probably capable of flight, supporting the hypothesis that the ancestor of the kiwi reached New Zealand independently from moas, which were already large and flightless by the time kiwis appeared"
In all fairness, in the days before it was possible to tentatively identify ancient pigment molecules in fossil remains, the depicted colouration of dinosaurs and their kin could only be educated guesses at best. But most living big herbivores - elephants, rhinos, buffalo, horses, antelope - are usually fairly dun, brown, or grey in colour, while big predators - lions, leopards, tigers, cheetahs - are mostly tawny and often with spots or stripes. Even big reptiles - crocs, monitors, pythons etc - are mostly grey, dull green, or sandy (at least on their backs) and with maybe stripes or dappled patches. But of course dinos weren't mammals. Unlike most mammals, modern reptiles and birds have full chromatic vision, and as a consequence they often use colour for communication, display and camouflage. I don't know whether its been shown that dinosaurs had colour vision but since both their direct descendents (birds) and the descendents of their ancestors (lizards) do, it doesn't seem unreasonable to assume they did. And the ability to see in colour might well explain other anatomical features such as the hollow/blood-vessel-filled patches on ceratopsian head shields and stegosaur plates, and indeed feathers on the heads of velociraptors or the pycnofibre "fur" on pterosaus. Interestingly there is a genus of pterosaur, Pterodaustro, that has strange upward-sweeping jaws lined with banks of baleen-like fibres similar to the structures in the jaws of flamingos. So it would appear that Pterodaustro was a filter feeder acting very much like the modern flamingo in its feeding habits. Flamingos are pink because of the pigment they obtain from shrimps and other small aquatic invertebrates. In capivity, when they often do not get their natural food, flamingos' plumage reverts to boring white, and so zoos have to give them artificial pigment to keep them a nice blushing pink. 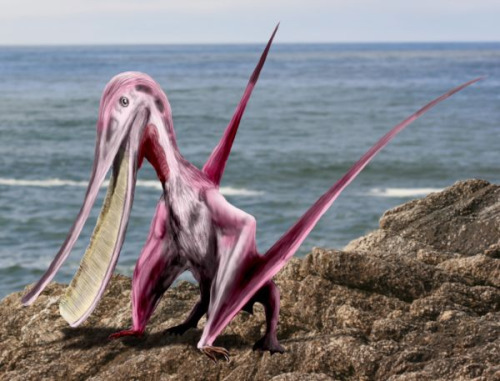 The inference of all this is that it is highly likely that back in the Cretaceous, flocks of Pterodaustro were all clad in passion pink fur! At Dinosaur World, we present interesting facts about each dinosaur. Examples include, what they ate and unique charactaristics of each. However, we do have many books in the giftshop including information on creationism. Below is an example. Why is so little known about dinosaurs? Despite all the new dinosaur discoveries, little is known about the dinosaurs because all information comes from fossils and a lot of "educated guesses" have to be made. Where did dinosaurs come from? God created the entire universe and everything in it including all animals (Gen 1:20-25; Exodus 20:11; Genesis 1; John 1:3). Are dinosaurs in the Bible? Dinosaur-like creatures are mentioned in the Bible including "behemoth" and "tannin". Perhaps the best example is in Job 40. What were the dinosaurs like? Man and dinosaurs lived together and man were masters over all God's wonderful creatures. (Gen 1:26, 28) In the first early days, all animals were friendly and under man's control. None of the animals ate meat or killed. God provided for all. There was no sin, no death, no evil and no disease. It was after the flood that things changed. What happened to the dinosaurs? The Bible says that a great flood covered the entire earth. All but those on Noah's ark were killed, including dinosaurs. Were dinosaurs on the ark? The Bible says one set of every air breathing land animal was on the ark. (Gen 6:12-20; 7:15-16). Young dinosaurs would be small and easier to care for than the full grown ones. What happened after the flood? After the flood, the earth was very different and temperatures had changed. Some places were very hot and some very cold. Many parts of the world were too harsh for the dinosaurs to live and much harder to find food to feed their enormous bodies. It is not just dinosaurs that have become extinct. In the last 350 years alone, almost 400 species have disappeared. After the flood man also was responsible for killing many animals. The wooly mammoths and mastodons where wiped out by humans. What about "millions of years old"? Just because something is fossilized does not mean it is millions or even thousands of years old. When conditions are right, a bone can become filled with minerals quickly. The main ingredients are quick burial, water and minerals. Conditions during the flood were ideal for creating fossils. And if you want to visit their website ... they have three parks in the southern US states and - joy of joys - are NOW HIRING! I'm about to fire off my resumé. It seems to me that the enless variation in nature, and the obvious inter-relatedness of all species, is one very big argument for NO God, and especially not an 'intelligent designer' of a God. I've always felt rather sorry for Adam being given the enormous task of naming all the endless variety of animals, birds etc. - and being given just a day to do it. What an awful job. You get a rather endearing picture of all the critters lined up patiently (no fighting, no hissing, no pecking, no eating one another - who on earth disciplined them all?) waiting to be told what they are - including the 3000 different sorts of snake let loose on the planet. The last snake to be named was an awkward so-an-so, of course. I always visualise him arguing with Adam: "What do you mean, I'm a snake? I'm not just any old snake, I'm the serpent." But the whole thing is a lovely story - or two stories, rather. And hasn't it lasted? Good stories always grip the imagination. Sorry, interrupting an interesting discussion. But that's not actually what I said, is it? I don't believe in God, so I wouldn't have said that. I'm not sure Adam would have had to name all the different snakes - probably just managing snake would do. It's a problem even when you don't have to think up the names in the first place. When I am going to sleep by listing things, sometimes they are animals. I get the domestic animals first usually - cats, dogs, sheep, then others. But one cat serves for all domestic cats (though not for leopards and cheetahs and lions) but I got a little stuck with camels and dromedaries. Are they just one animal, or should I consider them as two? I'll just repeat Temperance's last sentence for me, too. You're splitting hairs, Caro. As opposed to Adam who was splitting hares. MM, you might be interested in this journal synopsis of a symposium held in Denver in 1999 regarding feather evolution. I found it fascinating, especially the warnings at the end regarding too much conjectural analysis frightening away the serious bods and attracting the nutters (if I am reading it correctly), something that most definitely seems to have happened with a vengeance in the USA in the meantime. Also, I seem to remember that there is less confidence these days in attributing direct lineage back from today's avians to Archaeopteryx. In the symposium Archie's role as direct ancestor is more or less taken for granted. I'm not sure Adam would have had to name all the different snakes - probably just managing snake would do. On the basis of our earlier discussion concerning birds, it is clear that nowhere near the number of species extant today would have been involved. Adam presumably needed to name only one ‘snake’ (or at the most possible a few major anatomical differences, like ‘python’, ‘rattlesnake’, ‘cobra’). Likewise for many types of animals. I also found the bit about parrots very helpful. I cannot help but wonder now whether the really important serpent was a python, a cobra or a rattlesnake. And how come - as all the other animals were behaving so well (see article) during the naming ceremony, processing in what is described as an "orderly" manner - no one spotted that he was an obvious troublemaker? Parrot: Please sir, he's just eaten one of them furry things. Dear Lord, I know it is cruel to bait anyone, even Creationists, but who can resist the temptation? Sorry again, MM and Nord. Really will shut up now. It's just it makes me cross - they make such a farce of it all. 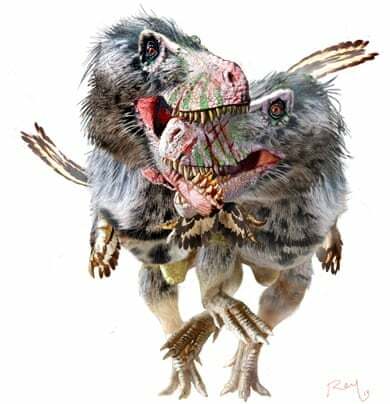 Is it a misapprehension on my part that these hair/feather type processes are only found in therapods, animals which primarily had a bi-pedal locomotion when on the ground or is there any evidence for them on quadrupedal dinosaurs? Also, it seems to me, that apart from thermal insulation, feathers' main purpose is in display and thus sexual selection and this has implications for what might be termed evolutionary process and societal structures in these creatures. Where there is that element of individual choice in breeding partners, as opposed to, say, animals where the alpha male and female are the principal breeding partners, there must surely be more opportunity for random genetic variation and for it then to be passed down or is that nonsense? It's also interesting, well I think so anyway, that birds of all the vertebrates have evolved the most diverse, colourful and spectacular variations of external appearance. I wonder why? As an aside, I was watching Springwatch and was taken by the red necked phalaropes, teeny wee water birds which have reversed the usual sexual dimorphism, the females have the vivid breeding plumage and display and compete for males and then the males do all the boring child rearing. Here's to the feminist phalaropes. And it was always a good discussion point on the old BBC science message board .... especially for baiting the evangelising Young Earth Creationists! Still happens on the BBC Points of View board and it's still good fun. There are far more species of beetle than there are species of snake. Darwin is supposed to have remarked that "the Creator must be inordinately fond of beetles because he made so many of them". The story may be apocryphal or might be more readily attributable to the biologist JBS Haldane but either way it's quite true - the earth is home to some 30 million different species of beetle. the earth is home to some 30 million different species of beetle. In the 1980s, there were just two methods of estimating species. In the case of beetles, these gave a mean of 17.5 million species and a range of 4.9-40.7 million. For all terrestrial arthropods, the mean was 36.8 million and a range of 7-80 million. However, the new research shows that four current methods of estimation -- dating from 2001 onwards -- suggest much lower figures, namely a mean of 1.5 million for beetles (range 0.9-2.1 million) and 6.8 million for terrestrial arthropods (range 5.9-7.8 million).